Have you ever wondered how in the world you’re ever going to achieve that hourglass figure you so desperately need to make all these wonderful new clothes look fabulous? The answer, of course, is the corset. Today we call them shapers but shapers take many forms. The corset or waist-cincher will be the piece you’ll wear to draw your waist in and give you that hourglass figure of a tiny waist, making your breasts look fuller and your hips look rounder. It’s important to know that a bustier is a corset with a bra all in one piece. A true corset covers the torso and rises to just under the breasts leaving the breasts uncovered. The corset usually has stays or bone within its structure to provide the stiffness needed to hold your torso in place. The stays traditionally were made from animal bone or cane but today, stiff metal or plastic strips sewn into the fabric does the trick. Generally speaking, the higher the price, the stronger the corset. 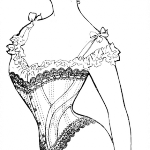 In Victorian days, ladies were often tightened into their corsets to the point of fainting for lack of oxygen. Those ladies were said to have been “having a bout of the vapours”. Corsets are usually laced up the back to tighten so often help is needed to cinch it in but many shaper manufacturers today recognize the impracticality of that and cinchers with front fasteners are easy to find. Often corsets have built-in garters to hold up your stockings but alternatively, you can wear a separate garter belt to do the job. Our friends at Suddenly Femme have some wonderful corsets for you to play with to help give you that fabulously feminine silhouette you dream of. Check them out here. If budget is an issue, check out these more moderately priced corsets from Amazon. Here are two of my favourites.